Tis the season to get crafty! This last weekend was my neighborhood’s holiday decorating blitz, the wreaths are up, the lights are shining, and the inflatable Santas are waving. 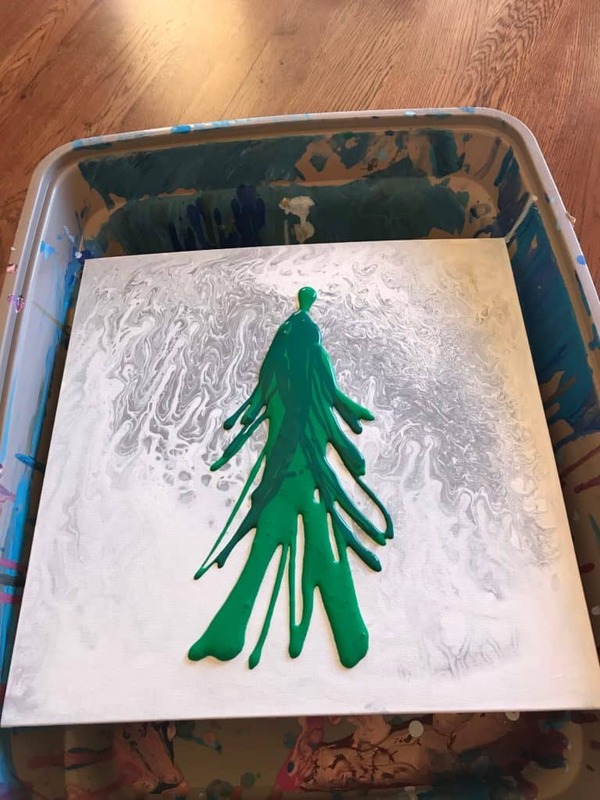 While I was trimming my Christmas tree I got to thinking, “hey, this could be an interesting pour project…” and so began the early stage of my newest project. Living on the west coast now, I don’t seem much snow during the winter season. So, I decided to give myself a little white Christmas through this lovely art form. My vision was a proud Christmas tree, shining bright during a silver storm of snow. 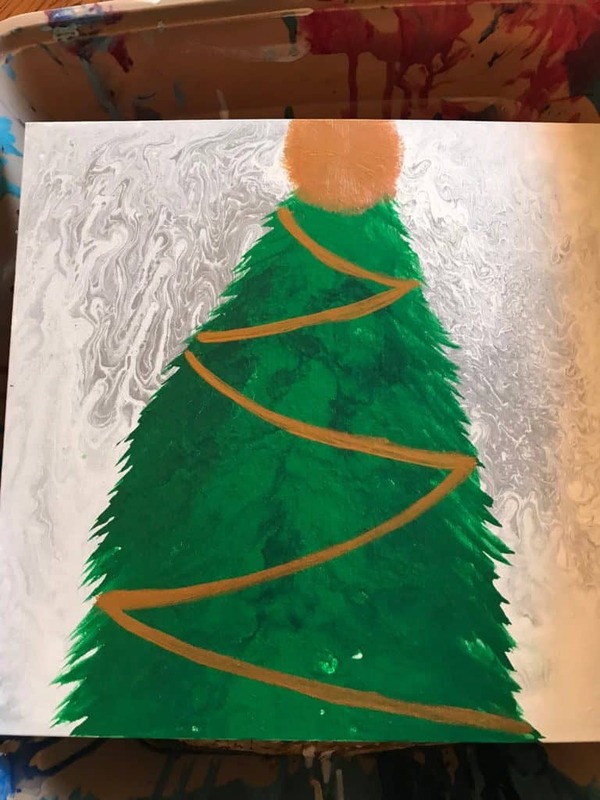 I knew this pour would take multiple techniques and steps, one for the background, one for the tree itself and then my embellishments, I had set myself a little Christmas challenge. This holiday season, I decided to test myself as a pourer and try a technique I’ve long admired but never tried: air blowing. I had it in my mind that air blowing would be the perfect way to get the haphazard look of those pine fronds. Suffice to say I still need a lot of practice before I get the technique just right, but more on that a little later. A lot of different mixes and formulas went in to this project. 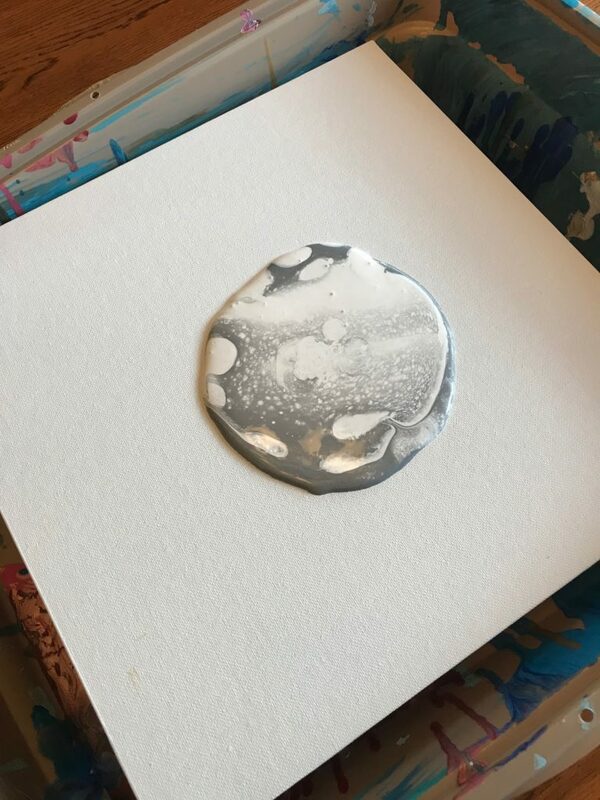 For starters, I wanted my silver and white background to be swirly and cellular to mimic a snow flurry. I’d had a bit of luck with this in one of my previous pours so I decided to give that another go, but with more WD-40 to hopefully up the cells (Santa, this year I would like a butane torch for Christmas). The little blob that came out of my flip cup was so promising and just what I was hoping for, it reminded me of a freshly shaken snow globe. The paint wound up being a bit thicker on the canvas than I thought it would be based on what I had working in the cup, but nothing a bit of tilting and some poking couldn’t manage. 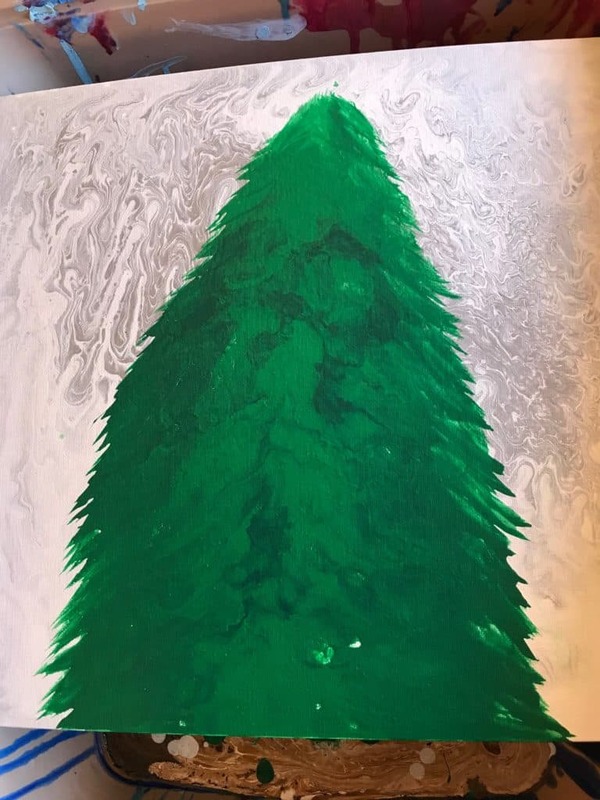 I wanted my tree to have dimensions in its colors, I didn’t just want a bright green blob taking up space in the middle of my beautiful snow storm. So to get the richer colors I wanted I mixed my bright green with a bit of that deep, deep ultramarine blue that I firmly believe any artist should have in his or her arsenal. I wanted this batch to be thinner so it would spread the way I envisioned during the blowing process but not fully watery, it was a hard balance to strike. I wanted to help myself as much as I could so I poured out my blowing color in the rough shape of a little tree. When the time came to blow I was far too timid and the paint didn’t do what I was hoping it would. The blowing technique is definitely harder than I assumed, the paint is unpredictable and can’t totally be guided where you want it to go. Looking back now I think I could have gotten the spikey effect of pine fronds if I’d used a smaller straw, but this is all such a beautiful learning experience! What I wound up with after I was light headed from manipulating the paint was a bit of a blobular mess, but I believe that no piece of art is a mistake or a lost cause so I broke out my little paint brush set and gave it a flick of the wrist here and there. 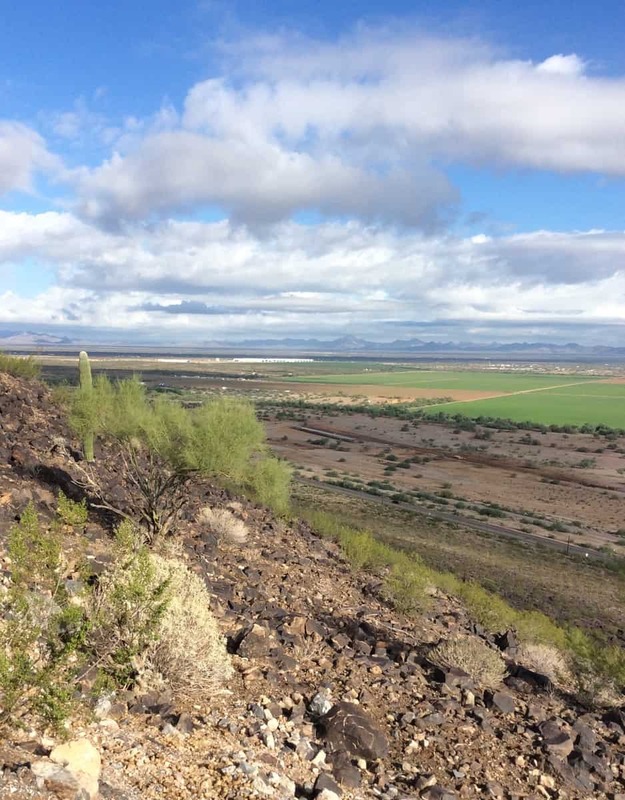 With everything finally starting to look like a tree and not just a big green monster coming for my Christmas cheer I was able to take a step back and admire what I’d done. 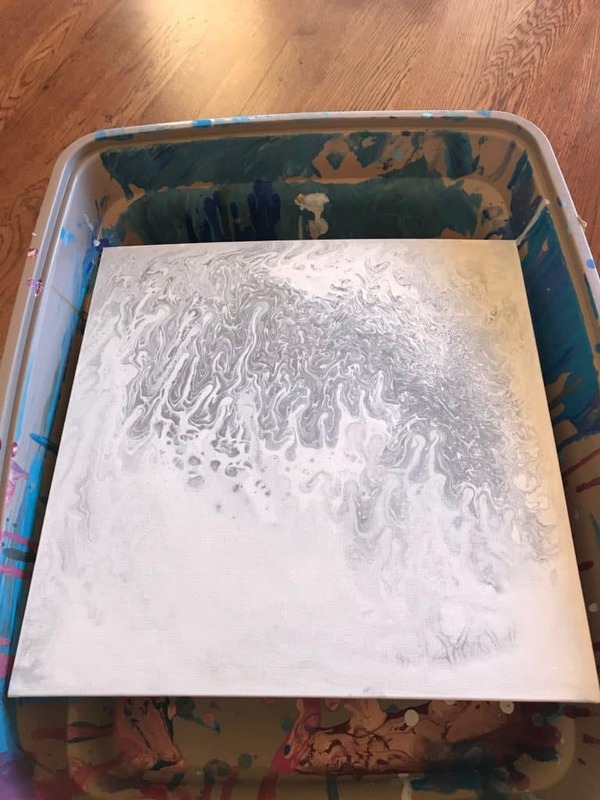 So the technique I tried didn’t pan out for me this time, but the colors working on my canvas were just what I wanted. I didn’t use any silicone in my greens because who has ever heard of a tree with cells? After everything was dry and I ruled out anything needing a repour, it was time to trim this tiny acrylic tree. I started with some strands of gold garland, added a few festive red ornaments and finished the whole thing off with a bright metallic tree topper. This project was so much fun and wound up being an entire day of crafting in between my other decorating duties. I hope this most wonderful time of the year brings me more ins-pour-ations!